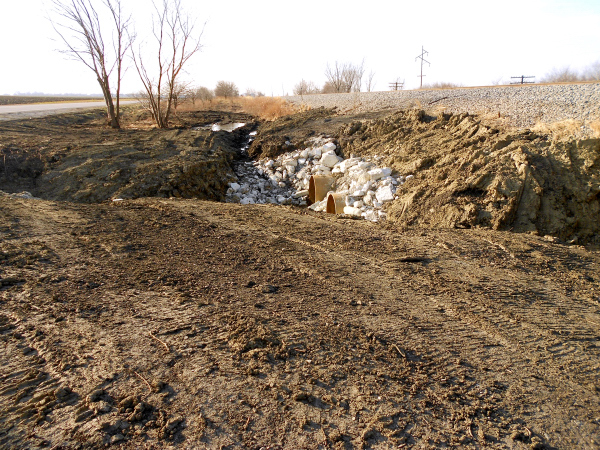 A failed culvert on the CN railway near Askum, Ill., began to pose a threat to rail bed integrity. The original part of the pre-existing drainage system was a stone box-style culvert. When a siding was added to the mainline years later, a section of corrugated steel pipe was simply added to the existing culvert beneath a widened berm. A hydrologic study determined that even if the culvert hadn’t failed, it would not have been adequate to handle a worst-case scenario 100-year-flood. The culvert needed a significant upgrade. 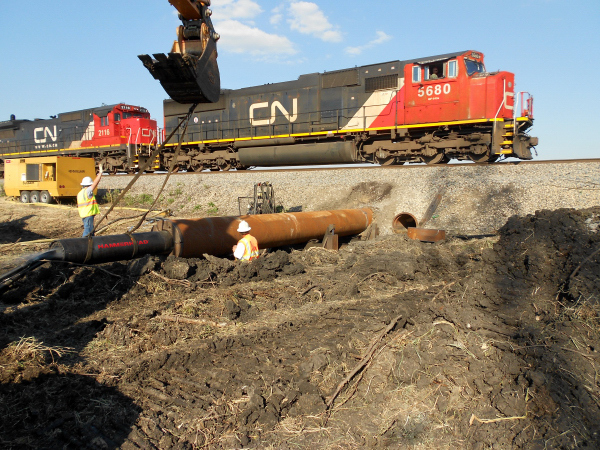 CN chose Hurk Underground of Grinnell, Iowa, to replace the failed 36-inch culvert with two 90-foot-long, 60-inch-diameter, smooth wall pipes of ?-inch steel. The center line of each new pipe would be located 6 feet to either side of the failed culvert’s center line at a grade of 1.1 percent. Further, Hurk would decommission the failed culvert, backfilling it with control low strength material cement. 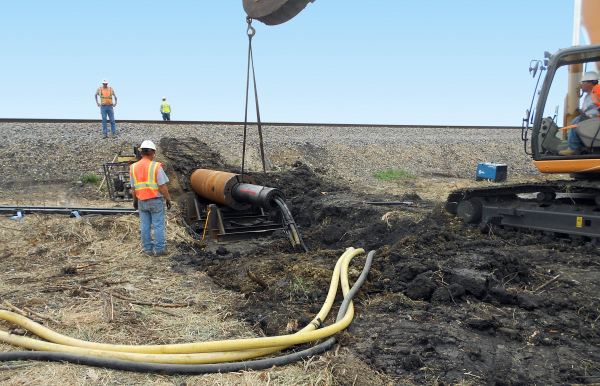 Hurk Underground is a horizontal directional drilling and pipe ramming contractor that specializes in culvert cleaning and restoration. Hurk Underground’s project manager, Jason Pollock, said Hurk has preferred the pipe ramming technique for jobs like this since about 2007 and so far has taken its pipe ramming expertise to jobs from Detroit to the West Coast, from Canada to the Mexican Border. 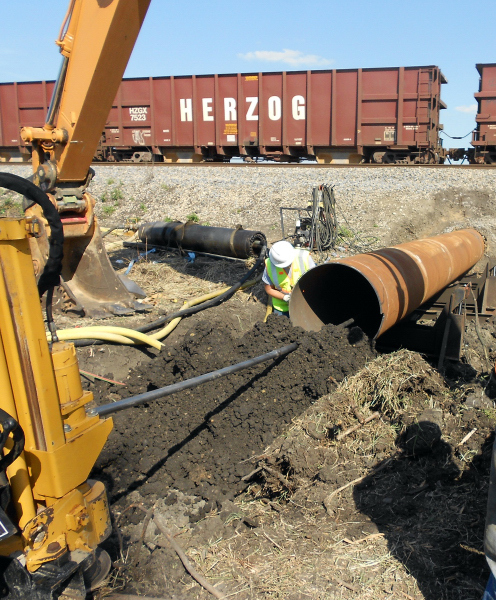 Hurk’s ramming tools are made by HammerHead Trenchless Equipment of Oconomowoc, Wis. On this job the equipment consisted of a 20-inch HammerHead ramming hammer with a 60-inch collar to attach it to the pipe. Pipe Mule, HammerHead’s pipe leveling system, enabled the Hurk Underground crew to keep the pipe aligned and on grade. A 24,000-pound horizontal directional drill fitted with auger flighting was used to remove spoils during the installation process. A portable compressor was also on site to power the pneumatic hammer to HammerHead’s specifications of 1,700 cfm at 110 psi. The surface of the rail bed presented a jobsite scenario known as high fill or deep cut, which was difficult to survey as it was more than 15 feet above the culvert. Buried utilities and fiber optic cable would be located and then protected throughout the installation without disconnecting service. Constant rain and standing ground water made ramming operations difficult. To keep surfaces from being too slick for personnel and equipment, Hurk created a rock base and ran dewatering pumps in the entry pit continuously throughout the project. A paved state road and its Illinois Department of Transportation culvert were just 50 feet away. Pollock said he was concerned that if the pipe’s progress were to stop due to spoils buildup while it was still extending too far from its entry point, he wouldn’t be able to get his HDD rig behind it to clean it out. Pipe ramming was performed in two separate runs. Each run consisted of ramming and connecting three 30-foot sections of pipe. Each section was set in place at the entry pit. Then the 60-inch adaptive collar and 24-inch ramming hammer were attached to its end. The crew aligned the pipe using the Pipe Mule leveling system. The hammer rammed the pipe at 177 blows per minute. However, he took the precaution of stopping each time a section had been driven its full length to remove its spoils. Then the crew set a new section set in place, welded it to the previously installed pipe, and began ramming again. The precautionary step ensured that no more than 30-feet of spoils ever accumulated in the pipe at one time. Pollock said each 90-foot culvert was installed within a couple inches of the 1.1 percent target grade, meeting CN’s operating specifications. The installation was performed without ever disrupting rail traffic or the nearby highway traffic. Not only was the technique less expensive than an open cut replacement, but it also permitted the railroad to continue generating revenue without interruption throughout the project. Pollock explained that only a few companies have gone through the complex certification they did to qualify as bidders in this niche market. These competitors, though, all use auger boring systems, which gives Hurk a bidding advantage. Pollock said when he gets to pitch pipe ramming to new customers, one of the points he makes is that Hurk’s pipe ramming doesn’t require the same investment in precision pit construction as auger boring does, since pipe ramming technique controls alignment and pitch with the Pipe Mule system. “We used to use I-beams or other techniques, but these hydraulic jacks allow us to make adjustments.” The patent-pending Pipe Mule system allows alignment corrections to be made 9 inches left or right of center and pitch corrections 18 inches up or down. The crew saves time in pit construction and restoration, which reduces overall project time. And Hurk has gotten to make use of another advantage of pipe ramming, a technique called “pipe swallowing.” On such a job a larger diameter pipe is rammed over existing pipe, completely enveloping it. The pre-existing pipe is extracted as spoils are extracted, using any technique suited to the given situation. Pollock said the technique, which is unique to pipe ramming method, is an ideal solution in the right conditions. Hurk Underground has been contracted for DOT culvert replacement jobs that specified pipe ramming technique by name in the plan. At some point in the future Pollock said he might also see railroads specifying pipe ramming technique in culvert replacement projects. The HammerHead-equipped crews of Hurk Underground have already established a solid reputation for themselves as experts in pipe ramming technique and are capable of meeting the demand.